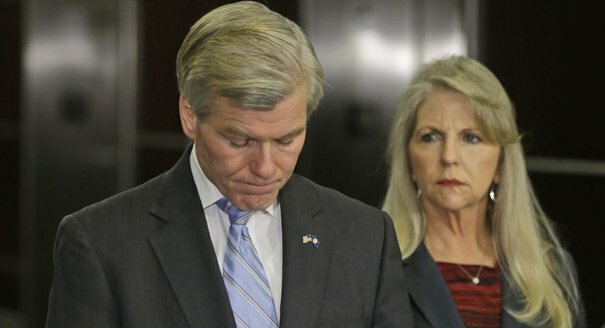 Former Virginia Governor Bob McDonnell and his wife, Maureen McDonnell, have been found guilty of corruption. Bob McDonnell, who left office in January 2014, was once a rising star of the Republican Party. A federal jury concluded that he and his wife – who say they are now estranged – used his office to endorse the dietary supplements of a businessman in return for lavish gifts and loans. They will be sentenced on January 6. Bob McDonnell, 60, was convicted on 11 charges, including wire fraud and receiving property based on his official duties. Maureen McDonnell, 60, was found guilty on nine of the charges. They were both found not guilty of falsifying financial statements. Both bowed their heads and wept as the jury delivered their verdicts of guilty. Although the McDonnells can appeal, they could face years in prison. “This is a difficult and disappointing day for the commonwealth and its citizens,” said the US Attorney for Virginia’s Eastern District, Dana Boente, outside the courthouse in the state capital Richmond. Bob McDonnell was once considered a possible running mate for presidential candidate Mitt Romney in 2012. But earlier this year he and his wife were charged with doing favors for a wealthy vitamin executive, Jonnie Williams, in return for more than $165,000 in gifts and loans. Prosecutors say Bob McDonnell was in financial need and traded on his position to win gifts of travel and cash from Jonnie Williams, for whom he arranged meetings with state officials. His defense team argued Bob McDonnell’s marriage was frayed and he was hardly on speaking terms with his wife who had a “crush” on Jonnie Williams and had accepted gifts from him. Bob McDonnell had apologized for his own “bad judgment” and said he regretted accepting the gifts and loans, but stressed he paid it all back with interest and broke no laws. The governor left office in disgrace in January at the end of his term. Virginia governors are barred from running for a second consecutive term, and Bob McDonnell was succeeded by Democrat Terry McAuliffe.